UQ Art History students are creating their own history, curating exhibitions for the Summer Mixer program at UQ Art Museum. 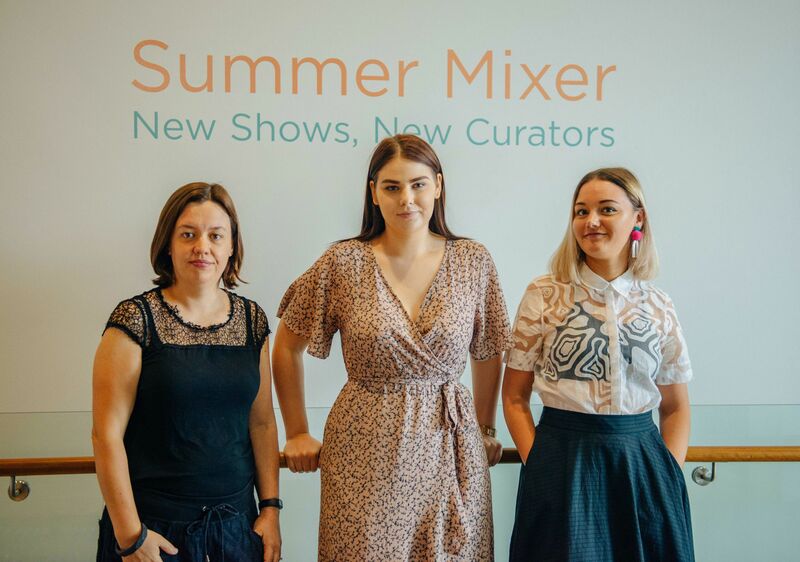 Summer is traditionally a time of rest for university students – but not for three Bachelor of Arts undergraduates who spent their holiday season honing their curating skills at UQ Art Museum. Bree Di Mattina, Brittany-lea Traverso and Taylor Hall completed the Visual Arts Curating and Writing course in 2018, where Art Museum Associate Director Dr Holly Arden introduced them to curating contemporary art projects. But little did they know that their newly acquired knowledge of devising exhibition rationales, creating floorplans and writing exhibition texts would become a professional reality quite so soon. UQ student art curators Bree Di Mattina, Brittany-lea Traverso and Taylor Hall. “Based on their exhibition proposal assignments, which included selections from more than 4000 artworks in our collection, we chose three students to share their concepts through a Summer Mixer suite,” Dr Arden said. Along with members of the UQ Art Museum’s professional staff, including Senior Curator Peta Rake, Dr Arden worked with the students over several months to prepare their exhibitions. “We have been delighted with the results, and believe the students have developed not only increased confidence but also greater curatorial intuition and a belief in their ability to see and experience art from a totally different perspective,” Rake said. Di Mattina&apos;s exhibit Figure Eight focused on eight Australian artworks that explore ingrained sexual and gender stereotypes found in society. “Each artist – Vivienne Binns, Angela Brennan, Eric Bridgeman, Barbara Hanrahan, Tracey Moffatt, Wendy Sharpe and TextaQueen – has taken inspiration from a story, an artwork, a poem or narrative, and reworked them in their artworks to try and represent a more balanced approach,” Di Mattina said. Traverso’s Punchline exhibition took a different tack, and examined artworks – by Tony Coleing, Peter Milne, Ann Newmarch, David Ray, Toni Robertson and Joan Ross – that employ satire to puncture Australia’s perceived egalitarian society. “My motivation for developing this theme stemmed from the desire to work with humour and art,” Traverso said. Whereas Hall’s Hold, Everything sculptural exhibition – with pieces by Paul Adair, Benjamin Armstrong, Mikala Dwyer, Rosie Miller, Caroline Rothwell, Koji Ryui, Alex Seton and Judith Wright – was “a chance to consider our innate relationship to materials”. “My objective was to push for a more tactile way of seeing, allowing the artworks to demonstrate the complexity of their material substance and the way they are read,” Hall said. Holding that thought, the successful launch of the Summer Mixer suggests it may become a seasonal staple for UQ Art History students. 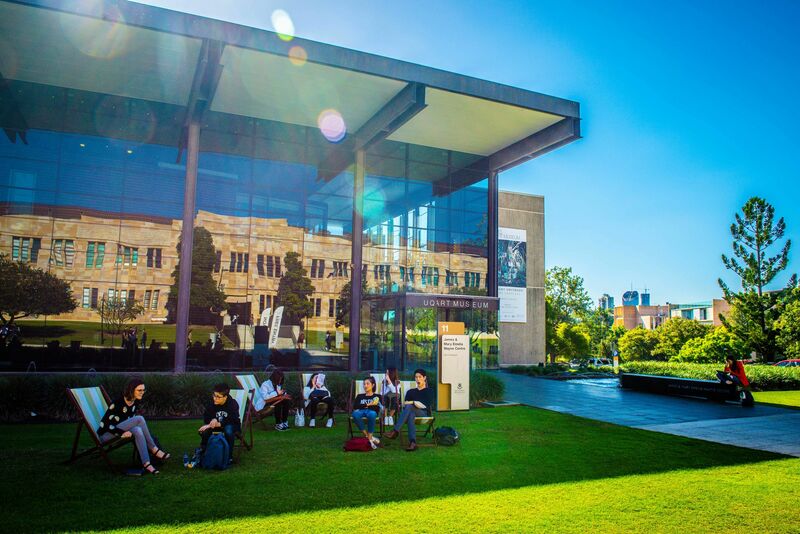 For more information about upcoming events, exhibitions and opportunities, visit the UQ Art Museum website.